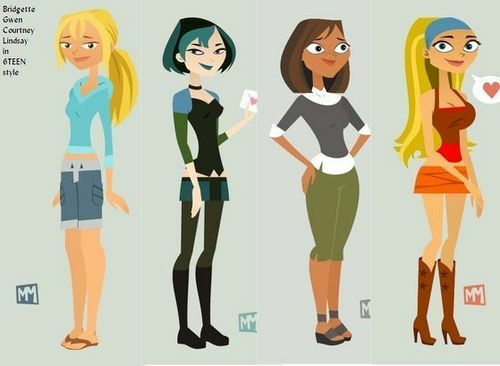 Bridgette, Courtney, Gwen and Lindsay 6teen style. I was boring and I found this. Wallpaper and background images in the टोटल ड्रामा आइलॅंड club tagged: cuortney lindsay bridgette gwen 6teen. This टोटल ड्रामा आइलॅंड fan art might contain चड्डी, leotards, तेंदुआ, unitard, शरीर सूट, बिल्ली सूट, लोटर्ड, यूनीडार्ड, बॉडी सूट, legging, leging, पैर कवरिंग, पैरिंग, लेग कवरिंग, चमड़े का मौजा, and पैर को कवर. OMG IT LOOKS SO AWESOME!! !